My hometown recently experienced an intense late summer heatwave. With temperatures hovering at a record-breaking 111 degrees one afternoon, I realized that I was the lone person outside at the normally busy community college campus where I teach. The people I did see outside as I drove home looked understandably weary and stressed by the heat. As I stopped to pick up a few things to prepare a light no-cook supper for my family, I noticed the trashcans outside the store were overflowing with cold drink cups. Inside the sparsely populated store, I saw some people grabbing watermelon and ice cream. A few others were at a freezer pulling out bags of ice. There is no doubt that extreme weather affects business. On that day, stores selling cold drinks and ice were bustling, while most retail stores, restaurants and other businesses were slow. Retail businesses usually see a significant drop in traffic during heatwaves and cold snaps or during stormy weather in any season. Even if your business does not count on in-person traffic, your employees may not be able to get to work or stay as engaged in their work during bad weather. In addition, your supply chain can be significantly interrupted by extreme weather conditions that cause icy roads or delayed air traffic. Since even the best weather forecaster cannot fully predict how weather swings will affect a business during an extreme weather event, there are some steps you can take to keep your business afloat during bad weather. Create a weather communication plan. Be clear about setting expectations and communication guidelines for your employees during bad weather. If you have to close your business due to a weather emergency, you don’t want some of your staff attempting to make it into work. Notify them via group text or through your website of any closings or delays in operation. For the same reason, have clear communication with your vendors and suppliers about what happens during unexpected weather-related events. While the weather may be a surprise, the way you handle the situation does not have to be. Keep up with short-term weather forecasts. As a business owner, you are accustomed to keeping up with economic forecasts and with business news. You need to add weather news to that list. Here’s an example. Knowing that its customers buy more soup in cold, damp and windy weather the Campbell’s Soup Company pays close attention to the weather. It even links its advertising to the weather forecasts in certain markets with an algorithm called the “Misery Index.” Therefore, if you hear a Campbell’s soup ad on the radio, chances are pretty good that the weather where you are is miserable. Diversify your product line. I recall a new small business in my town that sold primarily smoothies and iced drinks. The Hawaiian-themed drive-through kiosk seemed to be doing a brisk business during the summer tourist season. As fall neared, however, I watched closely for menu items that would reflect the upcoming temperature changes. Maybe soup? Hot drinks? However, nothing seemed to change and, not surprisingly, I saw a “For Sale” sign on the shuttered doors before the end of the year. Seasonal changes are predictable, but you can also experience the occasional cold snap during the summer and warm spell during the winter. Have options for your customers, so that you can meet their needs on a year-round basis. Check your insurance coverage. 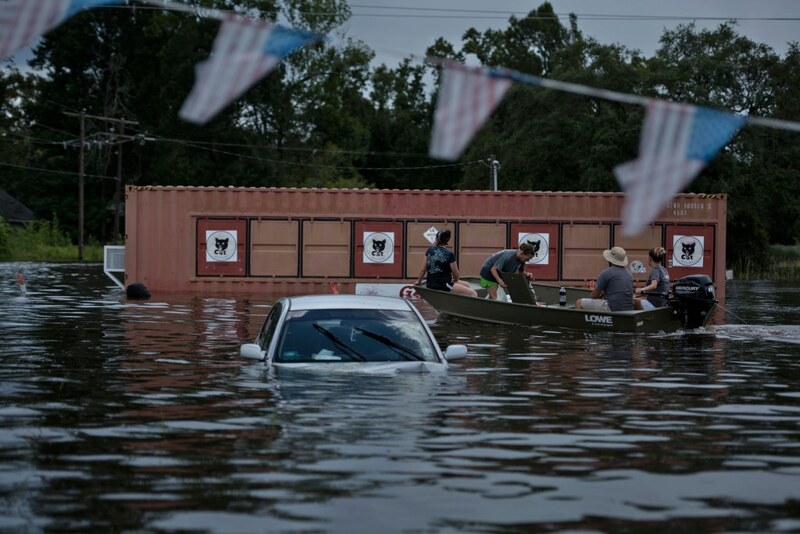 Extreme weather events, such as the recent floods in Louisiana, can devastate your business. The Red Cross calls the flooding in Louisiana the worst natural disaster in the U.S. since Superstorm Sandy in 2012 and estimates that its response efforts should reach at least $30 million. FEMA (Federal Emergency Management Agency) representative Rafael Lemaitre reported on August 21 that more than 25,000 people in Louisiana had already filed flood-related claims. More than 25,000 have filed flood claims for #LAFlood. @FEMA has already authorized more than $11 million in *advance* payments. Request a weather-related risk assessment on your business and business property from your insurance company. Shop around to make sure you have enough coverage if a weather disaster strikes. For example, while you may have property coverage, you may want to add business interruption coverage or data compromise coverage for your business. Have an emergency plan. In weather emergencies, the situation can worsen quickly. Although you hope you never need to implement it, it is important to have an emergency preparedness plan in place. The first step is to think about what weather-related problems could affect your business and what you can do to prepare for them. The type of emergency will determine the steps you should take to keep your staff, your customers, your inventory and your equipment safe. a list of contact information for people to notify, including supervisors, board members colleagues, clients family members and insurance company. the location and directions to the closest emergency shelter. Contact your local fire or police department if you do not know. Finally, it is important to remember that bad weather does not always affect us in predictable ways. Harvard Business School professor Francesca Gino and her research team asked 200 adults to predict the impact of weather on work productivity. More than 80 percent of the respondents predicted that good weather would increase productivity and that bad weather would decrease productivity. However, that supposition may not hold up in the real work world. As part of its research, for instance, the Harvard team examined findings from a Tokyo bank that showed its workers were more productive during stormy weather than on clear, sunny days.The Harvard team’s follow-up studies confirmed the trend. Perhaps this research shows that even the best laid weather plans can be thrown off by a beautiful day.